Whether you’re planning a romantic date night in with bae or inviting the girls over for a Galentine’s Day party, a festive Valentine’s cocktail is the perfect way to set the mood. 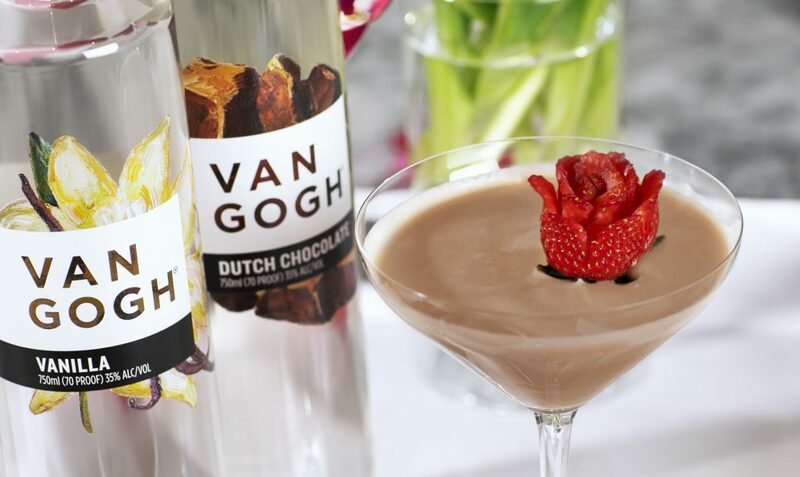 With bold, vibrant expressions like Van Gogh Dutch Chocolate or Van Gogh Vanilla, you can keep things simple and create a delicious chocolate vodka martini with just a few cocktail ingredients. Saving time on the front end will leave you with more time to explore cocktail garnish ideas and craft creative garnish art they’ll fall head over heels for. 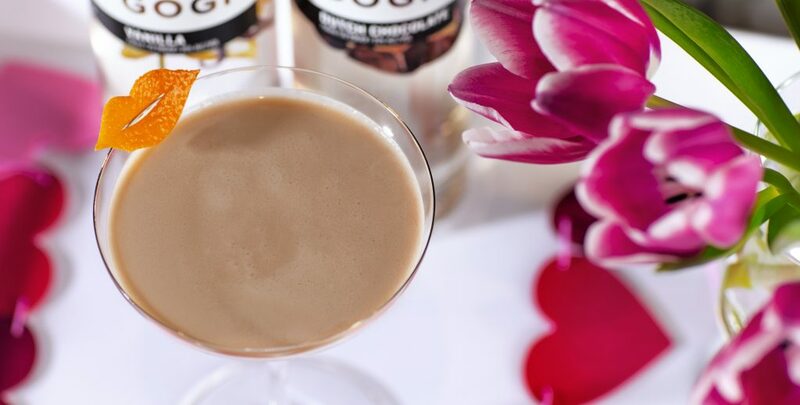 This Valentine’s Day, #GoghCreate our Love At First Sip Martini and add a special touch with one of four romantic cocktail garnish ideas! 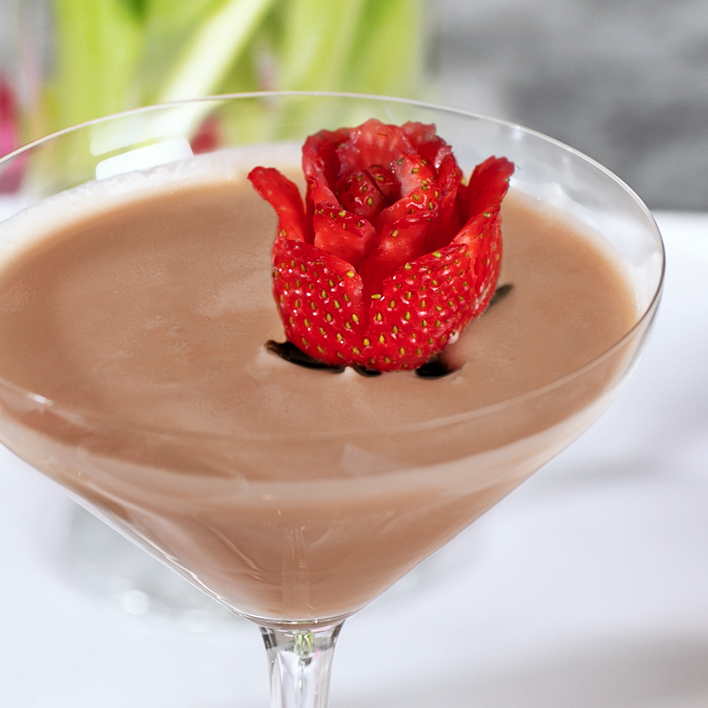 Pour vanilla vodka, chocolate vodka, chocolate liqueur and cream into a shaker with ice. Shake well and strain into a martini glass. Add a festive garnish of your choice. Step One: Set the strawberry on a cutting board, leaf side down. Step Two: Starting about ½ inch from the base, make a 45 degree angle cut inward about ¾ the way through the strawberry. Step Three: Use your knife to curl the tip of the “petal” by pressing it back. Step Four: Make two or three more petals, repeating steps two and three around the entire base of the strawberry. Step Five: Starting just above the base row of petals, repeat steps two through four to create the next row of petals. If there’s room, add a third row around the tip. Step Six: Finish your rose by pushing the tip of the strawberry inward. Stick a skewer through the middle of the strawberry and balance it on your martini glass. Step One: Take a large, thin piece of orange peel and lay it on a cutting board, outside facing up. Step Two: Use a knife to trace the outline of the lips into the peel, cutting all the way through. Step Three: Remove the excess peel and discard. Then, make a horizontal slit through the middle of the lips. Step Four: Place the lips on the rim of your cocktail glass and press down in the center to secure them to the rim. Step One: Remove the stem and leaves from a strawberry. Step Two: Holding the strawberry tip-end down, cut it in half. Take one of the halves and deepen the V-shaped notch at the top, rounding out the rough edges with your knife to create the top of the heart. Step Three: Stick a blackberry on an arrow toothpick. Then, add the strawberry heart and the last blackberry. Step Four: Balance the toothpick on the rim of your martini glass. Step One: Fill one bowl with simple syrup and one with sugar. Step Two: Dip the rim of your glass in the simple syrup and spin the glass so the entire outer edge becomes moist. Step Three: Repeat step two in the bowl of sugar, ensuring an even coat around the entire rim. Step Four: Place heart sprinkles around the rim of the martini glass, spacing them about ½ inch apart. Looking for more ways to channel your creativity this Valentine’s Day? Check out our festive boozy baking recipes!